Our Science paper is out ! We are very pleased to announce that our paper previously on ChemrXiv , and resulting from our collaboration with Joseph Moran’s group, has now been published on Science website. We studied the deprotection of a silane derivative bearing two possible silyl bond cleavage sites—Si–C and Si–O respectively, to show that it is possible, thanks to the strong coupling of the vibrational mode associated to one of them, to favor the cleavage of one bond versus the other, and thus the formation of one product of the reaction versus the other. 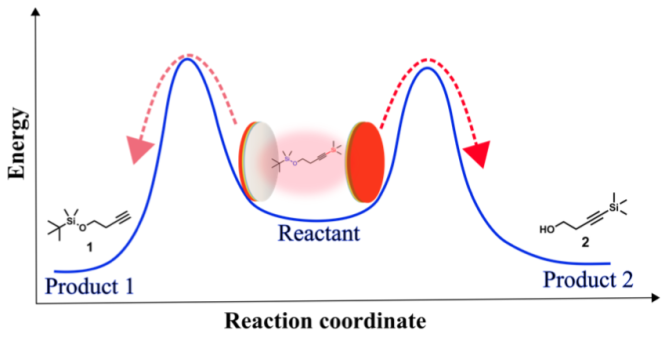 The examination of the thermodynamic parameters reveal the modification of the chemical landscape of the reaction under strong coupling. This brand new approach offers an alternative way to control chemical reactivity without catalysts, prefunctionalization, or chemical changes to the reaction conditions.